Wisdom of Life. : I was brought up by the cane. Johnny Woo, a young tenant who is staying in my house is a well behaved gentleman, and i almost treated him like a son. Over a dinner, as we were discussing the subject of raising and teaching children, he wasn't shy to reveal how he was caned by his dad and uncle when he was a child. The caning and punishment made him a well discipline person of today, he never hated his dad and uncle for correcting his wrongs. Yes! 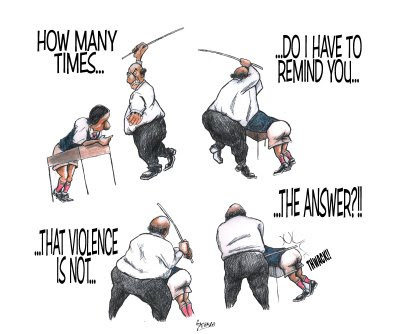 Those were the days when caning was the way to teach youngsters who were not behaving. I was caned in the school for fooling around. When i was only four, my mum was so furious over my wrong, tied my both hands, hanged me up without touching the floor and caned me properly until today i would never forget this episode. I was sad, frightened and a bit angry over mum but without those heavy and severe punishment, i would have not landed to what i am of today. "Thank you mum, you had taught me to me right". All my three sons had the similar treatment like when i was young. Non had escaped my powerful cane. I even went to their schools each new year to approach their class teachers, to give permission to them, to punish my sons if they were at wrong. I promised them i would not take action against them for caning my children, but rather i had to be thankful to the teachers for teaching my sons. Of my three sons, the eldest one Alvin was the most naughtiest. He had the most caning from me. Mind you! Today he is the bravest, out going, aggressive, ambitious and talented man. The other two are equally well behaved and kind hearted. Non regretted for being caned by their father. Today i don't see the cane anymore. Though two of my sons are married, their children are lucky not to see the cane in their homes. Their dads are scolding and nagging their children and they had forgotten how to cane their young. Sorry sons! I can't do it for you anymore. Time has changed. They have replaced the cane with Love but i hope it works for these children. Yes, I agree with you that most young parents do not use the cane anymore. However, I still believe that caning can do "wonders" at times. Sometimes I do need to use the cane on both my children, that's when they have forgotten that I own a cane. I do believe that it is good for boys to be naughty at times because they would be braver in the future. That's all for now... Take care. Tell you frankly...when i caned my children those day, my heart was very painful too at the sametime. They cried and i cried as well. They had to cry to learn and i had to cry and be responsible to them. Today i still cried with joy knowing they are doing well as parents. I know you would understand my feeling. Several months ago my 14 year old daughter began showing us disrespect, etc. School psychologists' suggestions proved useless. My neighbor suggested either spanking or caning. She preferred the cane: "a short, little lick will be quite effective". Bottom line (pun intended), after 2 licks to her legs and one hard lick to her bottom got her to partially revert to her former pleasant self. Threat, incentives & heart are the best way to teach our children.